It isn’t easy, running China, with its 1.3 billion people and 56 officially recognized ethnic nationalities. It’s a vast mix of languages, living standards, beliefs and customs. Run it successfully, and you have a prosperous, innovative, powerful empire to rival any the world has seen. Make mistakes, and the chaos will be vast and terrible. China is run by the Communist Party, which bases its legitimacy on delivering both stability and the conditions for prosperity. But stability is under threat as economic boom strands millions at the margin. Meanwhile rampant corruption is sapping people’s trust in the Party. Officials are increasingly seen not as public servants but as profiteers. This episode films patrols along China’s border with Kazakhstan, Party meetings, officials in Tibet trying to impose authority at the grass-roots, a village election, and a corrupt embezzler in prison, reprieved from a death sentence. Chinese people throughout, from farmer to Minister, speak frankly about the problems the country faces and the ways forward. Since 1987, village elections have been part of political life in rural areas. Elections were introduced to cities later. To westerners, the idea of “democracy” in a communist country might seem disingenuous at best, a sham at worst. As Suzanne Ogden, a professor at Northeastern University, a research associate at Harvard University’s Fairbank Center for East Asian Studies and author of Inklings of Democracy in China (Harvard University Press), explains, local elections play an important role in engaging everyday people in decisions that affect their community. In villages run by clans, illegal societies, or corrupt officials, however, voting simply reinforces long-standing power structures. One of the seeming ironies of China’s political reforms in the last 25 years is that the leadership, having once insisted that the Chinese were too backward and “feudal” in their thinking to allow them greater participation in the political process, chose to introduce elections at the grassroots level in the villages. Indeed, many of the trappings of traditional local politics — submissiveness to authority, patriarchy, gift-giving, bribery and even entertaining — had been, for decades, regarded by the Chinese as inextricable from feudalism. Moreover, introducing elections to villages, where people are typically less educated, before introducing them to cities, would seem to be counterintuitive. But the decision to introduce village elections was made for good reason: Once agricultural communes were abruptly abolished in the early 1980s, a new leadership structure had to be created to carry out local governance. Apart from addressing crucial local issues such as land redistribution, the elected villagers’ committee responsibilities included fulfilling national mandates such as the family planning, and grain and tax collection policies. 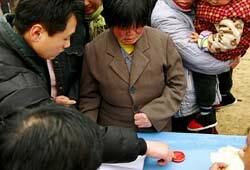 Still, village elections raise plenty of questions, particularly for Western observers. Are village elections just a ruse to strengthen Party control of the countryside? Or are they designed to deflect accountability from the Party to local officials? Or is their purpose to provide an institutionalized form of participation at the grassroots so that the leadership will be responsive to the people’s will? Since 1987, when the Organic Law of Villagers’ Committees first institutionalized village elections, electoral rights have steadily been refined. The law requires a secret ballot and a multi-candidate slate, which in practice means that there will usually be six or seven candidates on the ballot for five seats on a village committee. To combat Party interference, a law prohibiting Chinese Communist Party involvement in the nominating process was promulgated in 1998. The role of the village Communist Party committee — which is not the same as the village committee — is limited to screening candidates after they have been selected in a first round of voting by the villagers, to assure they are qualified and, of course, not “antiparty.” Moreover, now every candidate on a village ballot is supposed to be a write-in candidate. Nevertheless, most villages continue to rely on the local Party committee to nominate candidates, or at least to screen out objectionable candidates or winnow down a large field of candidates (sometimes dozens) nominated by the villagers. The continuing power of the Communist Party both above and at the village level has meant that the Party still strongly influences the field of candidates. 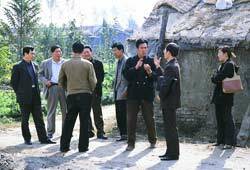 Today, the heads of the village committees are often already the village Party branch secretaries, and nonparty candidates elected to the villagers’ committee subsequently tend to be recruited into the Party. The concurrent holding of both village and Party posts is thus widespread, but many consider this a positive development, one which implicitly allows popular control over the Party, for in order to head the villagers’ committee, a Party branch secretary must be elected. The village representative who is elected before gaining membership in the Party is, however, more likely to represent local interests. While clearly “democratic” progress has been made through the introduction and refinement of village committee elections, so too has progress occurred in democratizing village Party governance. 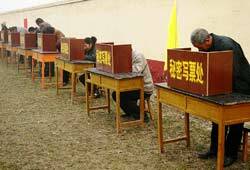 A number of provinces in China have adopted the “two-ballot system” for determining village Party secretaries, a system that allows even those villagers who are not in the Party to participate in nominating candidates for this position. Representatives from each family attend an all-village assembly, where they cast a secret vote on a blank piece of paper (or one that lists all of the village Party branch members) to choose one Party member as the nominee of the township Party committee. Although the Party insists that this is merely a “vote of confidence” for that candidate, it is supposed to be bound to nominate whoever received the most votes. By voting, villagers can screen out candidates they do not want. But then in the second ballot, the Party is back in control, because non-Party members cannot vote. Still, the Party’s dominance is sometimes undercut in another way: a Party chief who runs for election to chair the villagers’ committee and loses may be seen as not up to the job as Party chief, either, and may be relieved of the position. So who, then, are the “best” candidates in the eyes of the 800 million voters in China’s 900,000 villages? And how are their perspectives shaped by the local power structure, traditional Chinese rural values, local conditions, and the economic and social structure? First, many factors may inhibit the most qualified or “best” candidate from even running for the villagers’ committee. Technically, elected village officials are not “government” officials, and receive no salary from the central government, so monetary compensation for their work may be quite low or even nonexistent in the poorest villages. Cultural factors such as the chance of a “loss of face” may also inhibit the “best” individuals from running for village office. Other potentially good leaders might refuse to run because their decisions may generate ill-will: It’s not unheard of for leaders who carry out unpopular policies or who offend villagers to be beaten or even murdered, or their village office dynamited, their water buffalo poisoned, their crops destroyed, their houses burned, or even their rice paddies sprinkled with broken glass. Perhaps even more powerful than continued one-party dominance, at least when it comes to locally-elected leadership, is the presence of powerful clans. In rural China, “feudal” characteristics, such as superstitious beliefs and a low level of education, remain strong, and power is often based on underground societies and family/clan ties. In villages in which powerful clans bully the weak, villagers may greatly prefer local Party leadership that can reduce clan and criminal gang violence. But then most clans also have Party members, who when elected will protect the clan’s interest, so in some villages, the Party and the clans reinforce and penetrate each other. Similarly, if a village leader is also the leader of a “black” (illegal) society or religious group, villagers may find themselves subjected to pressure, including bribes, to re-elect him, even if he is corrupt or incompetent. Black societies often rely on religion, superstition, bribes and other illegal dealings (such as granting illegal licenses, smuggling, gambling and prostitution) to gain the villagers’ support and thereby gain power over the local economy and political system. In some localities, the village Party branch has lost almost all power as a countervailing force because it, too, is controlled by heads of black societies, clan leaders or religious leaders. Often one person in a single village fills all these roles. Since the introduction of village elections, local village leaders have worried less about being disciplined by the Party. Now they are elected, and their responsibility is to the voters, not to the Party. Further, as is the case in Western liberal democracies, the electorates are free to re-elect corrupt village leaders. At the same time, the election and re-election of incumbent Communist Party members as village leaders need not be seen as a sign of the weakness of the democratic process. Western liberals tend to assume that China’s rural citizens don’t want the Party to remain dominant, but this is not necessarily the case. What villagers want from a village leader is competence and an ability to make the village economy grow and defend village interests against pressures from above. Quite often, villagers will see members of the Party as those most likely to meet these needs, sometimes precisely because they are Party members. With these complications with local village elections, national leaders have faced a dilemma: restore the virtually total control of local Party branches over villages, or continue with elections, which have in some areas allowed the “feudal” aspects of Chinese culture to re-emerge. So far, China’s leaders have opted not just to keep elections but also to strengthen the electoral system so villagers will realize that it is their own elected village leaders, not the central leadership or the Party, who bear responsibility for problems at the local level. And often villagers do not necessarily care about corruption, as long as they ultimately benefit. Village officials with extensive family and personal ties with officials at higher levels (or even with factory managers) may actually be viewed as better positioned to protect their village from pressures from above or get them jobs in township enterprises. China’s rulers also need to satisfy popular demands for modernization in order to maintain legitimacy. Indeed, villagers seem far more interested in economic reform than in democratization, and some villagers think that elections have little to do with improved economic conditions. The members of a village I visited in Jiangsu province, for example, insisted that it was not democratic elections and self-government but roads that would bring prosperity: Building roads was the key to getting more factories, and thus, economic growth. In short, they saw no connection between elections and economic prosperity. In some villages, this is no doubt because they have re-elected the same officials they had before village elections were institutionalized. Indeed, peasants often say that for nearly a century, the smart and powerful people have controlled the village, regardless of changes from the Nationalists to the Communists, from pre-Cultural Revolution to post-Cultural Revolution, from pre-reform to post-reform. Elections also seemed relatively unimportant to villagers in a remarkably prosperous urbanized village I visited in Pudong District (part of Shanghai), at least in the sense that there had been almost no change in officeholders since the first set of elections. Other researchers have also found that the more prosperous villages are not necessarily the most advanced in promoting elections and self-government. To sum up, in spite of China’s traditional culture, its relatively low level of development and the continuing dominance of the Communist Party, villagers nevertheless participate in the political system at a remarkably high level. The electoral and representative system in the countryside cannot be dismissed as a sham, a cover for the implementation of dictatorial policies. The level of participation in elections and the habit of contacting village representatives who won the elections to express interests and concerns, either about village issues or township governance, are impressive. And, contrary to the views of sophisticated Chinese urbanites, villagers, even those with little formal education, are quite capable of making rational and informed choices. Their views may still be rooted in “feudalism,” but they have the capacity to judge which officials will best address their needs. So, yes, voters at the grassroots level are likely to take more responsibility for their own local affairs if the trend continues. The fact that almost all of the hundreds of thousands of demonstrations and riots each year in the countryside are directed at local leaders (and local enterprises), not at the central leadership, is evidence that elections have indeed made villagers feel the fault for their problems lies with the local leadership. Elections have also become more common recently in China’s cities. Urban neighborhood residents’ committees came into existence in the early 1950s, and efforts to revitalize and improve them led to a new law in 1990 that allowed elections for these committees. Unlike villages, however, the decision to initiate elections for urban residents’ committees came from the top down, not the bottom up. Also, unlike the 1987 law for village elections, the law concerning the election of urban residential committees has largely not been implemented, and few urban neighborhoods have actually carried out these elections. The residents’ committees are administrative organs charged with overseeing daily affairs within a defined urban neighborhood. Committee members are supposed to be elected, but in practice the committee chair tends to recruit members from what one scholar called “reliable and warmhearted retirees.” Alternatively, they recruit women and less-educated residents, because most residents do not want to serve on a committee they believe provides trivial services (delivering newspapers), or is intrusive or could cause hostility toward themselves (enforcing compliance with the birth control policy, collecting fees). Nevertheless, when elections for neighborhood committees are carried out properly, urban democracy has benefited from the same basic changes in electoral procedures as in the rural areas: more than one candidate per seat, a secret ballot and election by majority vote. China’s cities have not witnessed as dramatic a change in local government as have China’s villages. As mentioned above, the disbanding of the communal structure in the rural areas meant the government had to institute a new form of grassroots government to maintain order and promote development. By contrast, cities did not lose their administrative structure when economic decentralization occurred: Housing, tax collection, sanitation, security, population control and other such matters were still handled by the city administration or indirectly by the city through the work unit — the units in which all urban workers were organized before decentralization and the closing of unprofitable enterprises began in the 1980s — and work units largely overlapped with the neighborhood residents’ committees, making the latter’s role either redundant or subordinate to the work unit. This is changing because, as part of their efforts to become more efficient, work units have spun off nonproductive activities, such as their welfare responsibilities and their role as the grass-roots implementers of the Party’s policies. Most work units have already delegated many of the more onerous aspects of these policies and administrative duties to the elected neighborhood residential committees. Further, because urban neighborhood residents’ committees are powerless to affect major matters, residents don’t necessarily care that elections are not truly democratic. As long as the committee does not take a heavy-handed approach to residents, does not interfere too much with their lives and keeps the neighborhood in order, residents seem satisfied. Over time, however, the jettisoning of socialist economic policies in favor of capitalist ones has led to steadily growing ranks of the unemployed. The resulting urban labor unrest, together with the continuing disbanding of many work units that had been the organizational and social basis for the urban community, have led the state to support the elections of neighborhood residential committees. These elections are, therefore, gaining in importance, but the proportion of urban participation is small compared to nearly universal rural participation. 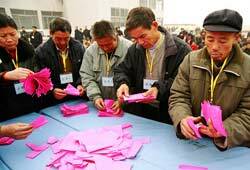 Shanghai (not, incidentally, the most progressive city in China in terms of elections), first held direct elections of residents’ committees in 2003, whereas participation in village elections was almost universal by the late 1980s. So has the relatively successful implementation of rural grassroots elections been a spur to urban elections? Yes, in the sense that had village elections failed to achieve the goals of China’s leadership, it would have been reluctant to promote them in the cities. But cities did not face the same crisis of governance as did the countryside when economic decentralization and reforms led to the disbanding of the communes. It is only because of the continuing erosion of urban institutions such as the work units, the growing labor unrest caused by unemployment and the massive influx of migrants, that the government has started to rely more on strong leadership of neighborhood residents’ committees; to encourage the development of a newer, larger organization, the “community” (shequ) that will encompass many of the neighborhood committees; and tried to promote real elections in the cities.